VANCOUVER, BRITISH COLUMBIA–(Marketwired – April 11, 2016) – Starting in April, Waterfront Shipping Company Ltd. (WFS), Mitsui O.S.K. Lines, Ltd. (MOL), Westfal-Larsen Management (WL), and Marinvest/Skagerack Invest (Marinvest) are proud to welcome innovative, clean-burning, fuel-efficient vessels to the sea. 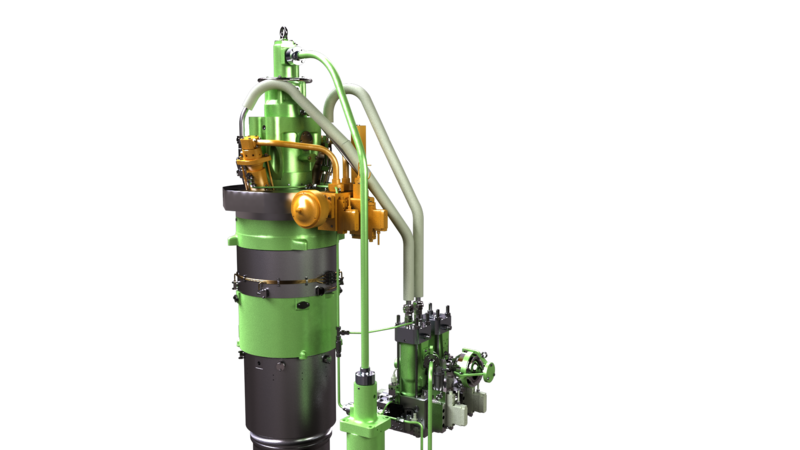 These seven 50,000 dead weight tonne vessels are built with the first-of-its kind MAN B&W ME-LGI 2-stroke dual fuel engines that can run on methanol, fuel oil, marine diesel oil, or gas oil. “Working with our partners to advance new, clean technology is an important and innovative step in the right direction. Investing in methanol-based marine fuel reinforces our commitment to invest in sustainable technology that not only provides environmental benefits but also an economically viable alternative marine fuel. 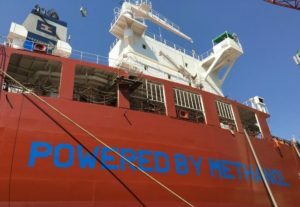 The cost to build new and convert existing vessels to run on methanol is significantly less than alternate fuel conversions,” stated Jone Hognestad, President, Waterfront Shipping. The traditional ship naming ceremony for two of the dual-fuel vessels, owned by WL with the second as a joint venture with WFS/Marinvest, will take place in Korea on April 18; officially taking delivery on April 20 & 28. MOL will take delivery of its dual-fuel vessel in Japan on April 22. “We are excited and proud of the delivery of our first vessel, installed with the first dual-fuel engine in Japan. We are pleased that our technical expertise has been utilized for this commemorative occasion. Having these vessels operating on methanol marine fuel provides shippers and port facilities with a practical and diversified fuel solution that meets today’s and tomorrow’s emission requirements,” states Yoshikazu Kawagoe, Managing Executive Officer (Technical), Mitsui O.S.K. Lines, Ltd. Waterfront Shipping, a wholly owned subsidiary of Methanex Corporation, is a global marine transportation company specializing in the safe, responsible and reliable transport of bulk chemicals and clean petroleum products to major international markets in North America, Asia Pacific, Europe and Latin America. Waterfront Shipping operates the world’s largest methanol ocean tanker fleet with its fleet comprising vessels from 3,000 to 50,000 dwt. Its fleet of 22 modern, deep sea tankers forms a seamless transportation network dedicated to keeping an uninterrupted flow of methanol moving to storage terminals and customers’ plant sites around the world. For more information, please visit www.wfs-cl.com/. Methanex Corporation (TSX:MX)(NASDAQ:MEOH) is a Vancouver-based, publicly traded company and is the world’s largest producer and supplier of methanol to major international markets in North America, Asia Pacific, Europe and South America. Methanex’s global production hubs are strategically positioned to supply every major global market. Methanex has an extensive global supply chain and distribution network of terminals and storage facilities throughout North America, Asia Pacific, Europe and South America. Methanex shares are listed for trading on the Toronto Stock Exchange in Canada under the trading symbol “MX” and on the NASDAQ Global Market in the United States under the trading symbol “MEOH”. For more information, please visit www.methanex.com. Mitsui O.S.K. Lines, Ltd., founded in 1884, is one of the world’s leading shipping companies headquartered in Tokyo, Japan. The company operates more than 900 of various types of vessels, including tankers, dry bulkers such as iron ore carriers, coal carriers and woodchip carriers, liquefied natural gas (LNG) carriers, car carriers and containerships. MOL and its group companies also provide business other than international shipping; terminal and logistics services, cruise ships, ferries, coastal liners and others. For more information, please visit http://www.mol.co.jp/en/. Westfal-Larsen & Co AS is the Norwegian ship owning entity of the Westfal-Larsen Group. The company dates its origin as ship owners to 1905, and is headquartered in Bergen, Norway. The group is involved in various business activities such as chemical tankers and specialized dry bulk shipping, property investments, trade and industry. The company is well established in the Commodity Chemicals tanker markets, and operates a fleet of modern vessels built between 2009 and 2012. All tankers are zinc-coated and fully IMO II. Westchart, a wholly owned subsidiary of WLCO, is responsible for the commercial management. Westfal-Larsen Management acts as technical manager for the chemical tanker fleet. For more information, please visit http://www.wlco.no. Marinvest is a private shipping and investment Group, part owners and managers of product and chemical tankers. Holdings include investments in tankers of about 80,000 dwt, chemical tankers between 20,000 to 50,000 dwt, a developing coastal shipping company and real estate. For more information, please visit http://www.marinvest.se/. 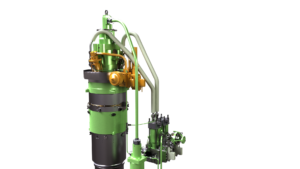 MAN Diesel & Turbo SE, based in Augsburg, Germany, is the world’s leading provider of large-bore diesel engines and turbomachinery for marine and stationary applications. It designs two-stroke and four-stroke engines that are manufactured both by the company and by its licensees. The engines have power outputs ranging from 450 kW to 87 MW. MAN Diesel & Turbo also designs and manufactures gas turbines of up to 50 MW, steam turbines of up to 150 MW and compressors with volume flows of up to 1.5 million m3/h and pressures of up to 1,000 bar. For more information, please visit http://dieselturbo.man.eu/. ← Is the neighbor’s green grass lacking morality?